Ireland and the UK are facing a major crisis with Fetal Alcohol Spectrum Disorders (FASD), a crisis fuelled by high rates of drinking by mothers and a poor response by government. 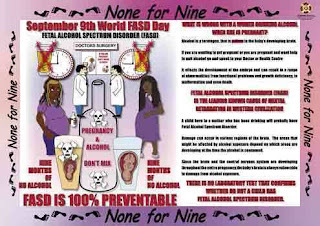 To coincide with FASD Awareness Day on September 9th, a special conference on 'protecting the unborn baby from alcohol' takes place in the European Parliament. As the organisers say, 'throughout pregnancy, even at low levels of exposure, alcohol interferes with the normal development and can seriously damage the unborn child. Case studies across Europe show there are a substantial number of women who continue to drink during pregnancy, it ranges from 25% in Spain to 35%-50% in the Netherlands and even higher rates in the UK or Ireland at 79%'. The more commonly known Fetal Alcohol Syndrome is a growing problem worldwide, affecting between 1 and 4 births per thousand. 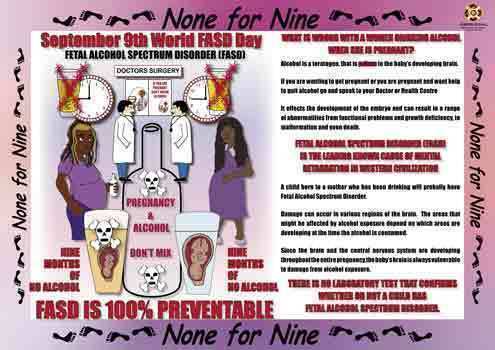 But Fetal Alcohol Spectrum Disorders covers a wider range of problems associated with drinking during pregnancy. Evidence Based Mental Health estimates that in Europe between 2–4% of all live births are affected. 'The majority of these children are described as having an alcohol-related neurodevelopmental disorder (ARND), manifesting in terms of problems with overactivity, inattention, behaviour or learning'. The problems caused to babies and children by drinking during pregnancy are the leading known cause of intellectual learning disabilities. Not only are there physical signs and growth problems, but as FASD Ireland notes, there are 'central nervous system abnormalities such as poor fine motor skills, poor eye-hand coordination; hearing loss which is not related to injury or illness and poor gait when walking'. Alcohol Action Ireland also warns that 'more than three drinks a day increases the risk of miscarriage, 12 drinks a week increases the risk of premature birth and sudden high levels of drinking damage the developing brain'. The effects are long term and far reaching. The University of Pittsburgh 2010 study followed 592 people up to the age of sixteen. They found 'a range of behavioural problems' amongst those born to 'mothers who had at least one drink per day in the first trimester of pregnancy', and nearly '60 percent of the male affected patients' were found to have 'conduct disorder as adolescents'. The narrow definition of FASD is clearly inadequate to describe the full scale of potential problems caused to infants by alcohol intake during pregnancy. Ireland is at crisis point with the problem. As Fiona Gartland wrote in the Irish Times this week 'In a study in Dublin’s Coombe Hospital published in 2006, 82 per cent of women continued drinking while pregnant – almost eight times as many as women in the US, where FASDs are notifiable and drinks carry a warning label'. This was confirmed in a British Journal of Midwifery study in 2009 which found that 'women in Ireland drink the most alcohol in pregnancy', and the government's own 2009 study which found that 26% of educated Irish women continued drinking while pregnant. Given that more women now drink in Ireland than ever before, with four in ten drinking to harmful levels and an increase of 29% in the proportion of Irish teenage girls hospitalised for alcohol related conditions, the problem of FASD must be reaching epidemic proportions. Currently, according to Inclusion Ireland, there are 'just under 27,000 people with intellectual disability registered on the National Intellectual Disability Database in Ireland. That is a prevalence rate of 7.38 per 1,000 of the total population'. Of course there is no suggestion that these figures relate to FASD alone, but given the potential rise in FASD, is the total number of children with diabilites now set to rise? And how is the country to cope given that 7,000,000 Euro in cuts to social welfare are expected in 2011 on top of the 6,000,000 Euro already cut in 2010? To do the sums, the 2008 general survey revealed that Ireland has the highest birth rate in Europe with an average of 6.000 babies born every month. If four out of ten women are drinking to excess, and 80% of those are still drinking during pregnancy, then potentially the well being of 1,920 babies per month is threatened. 'although FAS is a specific diagnosis...only infectious diseases are notifiable under ...legislation. Therefore Foetal Alcohol Spectrum Disorder (FASD) does not fall within the scope of this legislation. There is no National Register for Foetal Alcohol Spectrum Disorder (FASD). Therefore, the numbers of cases of Foetal Alcohol Syndrome (FAS), Foetal Alcohol Spectrum Disorder (FASD) and Alcohol Related Neurodevelopmental Disorder (ARND) in Ireland are unknown'. You would think this a matter for shame, or at least for a change in the legislation, but the Minister ducked out with the crumb that the Coombe Women’s Hospital, partnered by the HSE, is 'running a project' on FASD. Although a welcome move, the Coombe study has so far failed to identify many cases of FASD for two obvious reasons. Firstly it relied on self reporting to assess drinking levels, and so 'only 2 in 1,000 admitted to be heavy drinkers'. Secondly the babies were only studied for the few days or hours that they were in the hospital. As researcher Deirdre Murphy concedes, 'it is likely that some of the women were underestimating (or under reporting) the amount they drank. In general, fetal alcohol syndrome occurred less frequently than expected in this study, suggesting that it is either not recognized by medical staff, or only becomes apparent after the mother and baby have left the hospital'. The Coombe project is clearly not even going to scratch the surface of the problem. The situation in Ireland's drinking neighbour the UK is similar. As the Guardian reported last year 'FASD have so far failed to register on the government's radar, suggesting a pressing need for more integrated working between health and social care. Dr Mary Mather, medical adviser to Tact's foetally affected children's service, says: "Here we are doing nothing, and we suspect we have a bigger problem than other countries because we have one of the highest rates of teenage pregnancy and binge drinking in Europe." 'Because FASDs are not notifiable, there are problems with how cases are processed. The condition is hidden under a complex of ADHD and autistic spectrum or Asperger’s disorder to get services. Officially, there are no cases of FASDs in Ireland because they are not notifiable; it is a classic hidden disability. It seems we are 20 years behind North America with FASDs in Ireland, not dissimilar to how we dealt with child abuse. It is a socio-cultural issue. If a foetus is exposed to alcohol, it chemically increases its craving. I have seen six and seven year olds who steal cough medicines because they can smell it. They go to it like bees to honey"
Legislation and services aside, even the simple policy of putting health warnings on bottles seems beyond the two governments at the moment. It is effective. As Ms. Savage says, 'since 1989, the US has had warning labels on alcohol and there has been a huge drop in alcohol consumption by pregnant women to 10-12 per cent'. The Irish drinks industry is apparently ready and willing to act according to drinks industry ireland. Quoting the Acting Director of the Alcohol Beverage Federation of Ireland (ABFI), Kathryn D’Arcy it reports that 'the drinks industry had agreed this measure with the previous Government almost four years ago'. However 'work on the legislative proposals is on hold at present to await the recommendations of the National Substance Misuse Strategy (NSMS) Steering Group'. Admittedly it must be hard to report on a problem that the government has decided does not exist. There may not be much hope though, even if the labels are agreed. A voluntary code in the UK supervised by the alcohol industry's 'responsibility' wing the Portman Group aimed to put 'don't drink if you are pregnant' warning labels on all bottles and cans. It had the agreement of the industry, but after three years they had turned in what an independent assessment rated as only a 15% compliance. Alcohol Concern's assessement of the same issue was an even more dismal 4%. As David Norris recently said, quoting from Samuel Beckett, 'Ever failed. No matter. Try again. Fail again. Fail better'. The UK government have given the Portman Group a further two years to do just that. The second attempt at labelling has until 2013 before the issue of a failure of self-regulation can be discussed. Until then, with no sign of a government response, no official access to treatment and diminishing resources, Dr Malley's advice must stand. 'The truth is there are no safe amounts of alcohol in pregnancy'. Great post! Thank you for sharing valuable information. Keep up the good work. check out this for drug rehab center. Is the alcohol industry taking over the world?